The first step in understanding the cost of attending college is to determine your tuition and fees. Below you will find tuition, fees, and other cost estimates for the 2018-2019 academic year. You should plan to pay for all charges associated with the registration and enrollment process at the beginning of each semester. For additional information regarding tuition and fees, see the College Catalog. Start by determining your residency and course type, then expand the tuition table that best matches you. Then, you can find your approximate tuition cost based on the number of credits you plan to take each semester. LCC students whose permanent residence is in Colorado qualify for resident tuition rates as well as the College Opportunity Fund (COF) stipend. Not sure if you qualify for Colorado Resident status? See the College Catalog for additional information. Students from New Mexico can apply to receive resident tuition rates via a state-to-state reciprocity agreement. Apply to receive reciprocity resident tuition. See below for on-campus and online tuition rates for Colorado residents. Non-resident students are all those whose permanent residence is outside the state of Colorado. 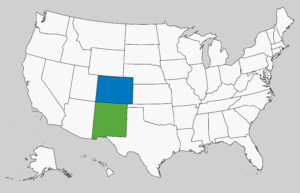 LCC is part of the Western Undergraduate Exchange (WUE) program, through which students from participating states (highlighted in the image) can receive a reduced tuition rate. Learn more about WUE in the LCC Catalog. Apply to receive WUE tuition rates. Students outside of WUE states and Colorado pay non-resident tuition rates. Non-resident tuition for online courses is the same regardless of WUE status. See below for on-campus and online tuition rates for non-residents. *On-campus international students eligible for scholarship of $203.00/credit hour; cannot be used for online courses. Medium/high-cost course fees: $7.20 per credit hour – The Colorado Community College System established this fee to address the higher cost of science, vocational and technological courses. Independent study fee: Independent courses require a $148.90 per credit fee in addition to tuition and other fees. Lab and other course fees: Lab and other course fees vary depending upon classes taken. Fitness Center fee: Some Fitness Center courses require a $18.00 Fitness Center Equipment Usage fee and a one-time $15.00 manual charge. CISCO Network course fee: $20.15 per credit hour – The Colorado Community College System established this fee to provide the funds necessary to support the cost of the Cisco Networking program at the various community colleges. Nursing Courses: All NUR (Health Professions) prefixed courses are currently charged a differential tuition fee of $75.10 per credit hour in addition to regular tuition. Certain courses and programs may require additional lab kits, digital textbooks, testing, and supply costs. Registration fee: The College assesses a $13.75 registration fee each semester. Student activity fees: Students enrolled in on-campus courses and programs are required to pay activity fees charged on a per-credit-hour basis. Fees are assessed per credit hour as shown below. Student Center fee: The College charges a fee of $2.70 per credit hour with a 12-credit-hour cap for funding the construction of a new Student Center. Campus Health Center fee: All full-time students (12 credits plus) must pay the Campus Health Center fee. This fee of $33.60 per student per semester provides full-time students with unlimited office visits at the Campus Health Center. Part-time students also have the option of utilizing these services for the same fee of $33.60. Athletic liability insurance fee: Students participating on the baseball, basketball (men’s and women’s), golf, softball, and volleyball teams are assessed a $165.00 fee per academic year. Students living in the residence halls are required to purchase a meal plan. Residence Hall Activity Fee: A $15.00 fee is deducted once each year from each student’s $150 housing deposit for Todd-Burch Hall and Prowers House. This fee is placed in an account reserved specifically for hall activities and maintenance of recreational equipment. Residence Hall Technology Fee: This $80.00 fee is for the collective cost of maintaining Internet service and equipment in the residence halls. Commuter Meal Plans: Commuter Meal Plans are available for students not living in the Residence Hall. Plans available are for 15, 30 or 45 meals. Payment in full must be made to the cashier and the receipt for payment is required to get a meal plan in the cafeteria. A full-time student’s average annual cost for books and supplies is $2,700.00. Please note that some programs require additional lab kits, digital textbooks, testing, and supply costs. Costs are payable by cash, checks, Master Card, VISA, or Discover.